Ahh... the smell of new crayons. Come on. Admit it. Regardless of how you felt about starting school again each fall — you looked forward to having a new box of crayons. Ok, at least I did. There’s something about the feeling of anticipation you get when you open up a new box of crayons. The smell of freshness, the crisp look of untouched crayon tips, and the amazing possibilities of everything you could create with those 24 (or more) waxy sticks of colored loveliness. It’s that time of year, time for school to begin and kidlets to get their fresh supplies. Backpacks, folders, glue, crayons, scissors…. Ziplock bags? We’ve had a few questions at The Grove Sun office about the extensive lists of supplies needed for the elementary students in Grove. A few wondered why name brand items are requested, for some things – like Crayola markers or Elmer’s glue, or Fiskar scissors. Others with multiple children, worried about having all of the supplies at once – or not at all – due to family finances. I visited with Julie Bloss, principal at the Grove Early Childhood Center, about some of the questions raised by parents. Remember when we (come on think back) were in pre-kindergarten or kindergarten, and we had a specific desk to keep all of our supplies in? Bloss said the ECC classrooms are designed using tables and chairs, rather than desks – so there’s no place to put individual supplies. She also explained why teachers don’t label the items with names. At this age, students are just learning how to write their names. In other situations, a center that uses crayons would have say, four buckets of crayons – and students would be instructed to just grab a bucket of crayons to use, rather than “go hunt in your backpack for your specific box.” The supplies are “community” and replaced as needed. She gave another example about preschoolers doing a project requiring glue. Picture 20 plus students needing to glue leaves to a nature collage; from a “management” standpoint, it’s easier for the adults in the room to hand out a few bottles of glue, and direct students to share them, rather than give each student their own bottle. Actually, I’m thinking it’s more of a common sense thing, because have you seen how preschoolers like to use glue? In terms of the name brand items Bloss said, for many supplies generic is fine. But for a few things, take Fiskar scissors specifically; name brand really does make a difference. She said teachers have found that little hands learning to cut, often get frustrated when using non-Fiskar scissors. The generic ones just don’t hold up to multiple use – or even cut the same way. Let’s face it, Crayola has the market on good, quality crayons and markers. Generic ones, in my experience as a kid minister, don’t hold up to heavy use. Oh, and about those “unusual” supplies, like Dixie cups, napkins, Ziploc bags or paper plates, Bloss said those items are often used during art, lessons involving cooking, or during the daily snack time. At least the classes aren’t still requiring protractors and compasses. For the record, I really don’t remember using the compass much in school – except as something to poke fellow classmates. For parents facing financial issues – or getting supplies for multiple kidlets – Bloss had a few great suggestions. First, get the supplies you can, now, while sales are going on. Get other stuff, as you can afford it. Your students will need stuff throughout the year – not just in August. She even suggested getting half of the supplies (especially when a quality of one item is listed) for the fall semester, and then pick up the other stuff in the spring – or as teachers make specific requests. Second, remember there’s no shame in saying, ‘I need help.’ Bloss said through the Delaware County Community Partnership and other Grove organizations and businesses, the ECC has a plethora of items ready to provide parents in need. She said parents can contact her privately, either in person or by email. They can also talk to their child’s teacher. Bloss said there’s always a way to make sure a child gets what he or she needs to be successful. Third, if you are one of those parents who can purchase a few extra things (or are kidlet free but love school supplies), why not pick up an elementary school list and grab a few items. Think of yourself as a School Supply Santa Claus as you drop them off at a local elementary school. You’ll get the joy in helping out a kidlet or teacher in need. School starts on Wednesday, Aug. 14. I may just pick up a new box of Crayolas in celebration of a start of a great new school year in Grove. Kaylea M. Hutson is the managing editor of The Grove Sun. She can be reached at kaylea.hutson@grovesun.com or 918-786-2228. 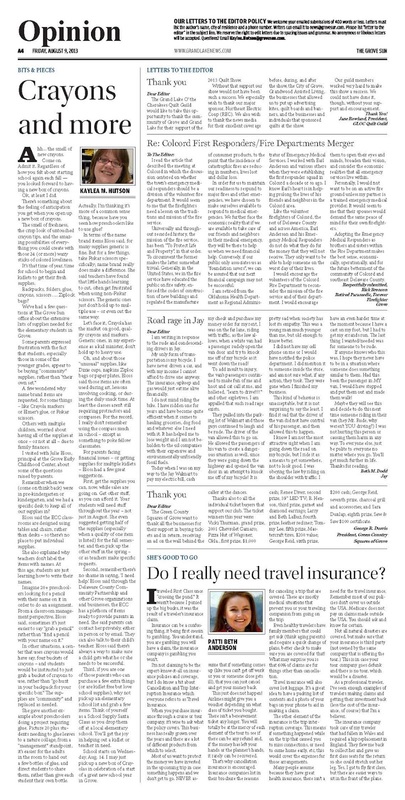 This column originally appeared in the Aug. 9, 2013 issue of The Grove Sun.